Ins Kleine Gebrachte Karte von den Sud-Laendern zur Histoire der Reisen. [Australia] - BELLIN, J.N. Title : Ins Kleine Gebrachte Karte von den Sud-Laendern zur Histoire der Reisen. [Australia]. Date : Leipzig, Arkstee & Merkus, 1746. Size : 8.5 x 11.4 inches. / 21.5 x 29.0 cm. Description :A uncommon map of Australia, one of the few 18th century maps concentrating on the Australian continent. With a reference noting a fictitious visit to south-west New Holland in 1637 by Duquesne. 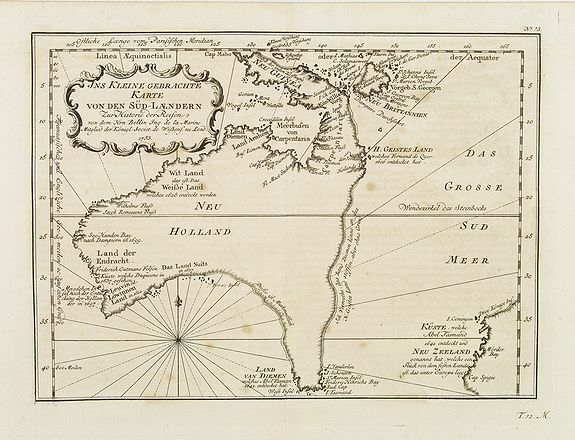 To the right lower corner references to Tasman's discoveries in New Zealand, with note "may well be part of a large Southland at the antipodes of Europe". In smaller format, he issued the Petit Atlas Maritime (1764), which contained 580 charts, as well as maps to illustrate l Abbé Prevost's Histoire Générale des Voyages (1746-1757). Bellin also produced a substantial number of important separately issued maps, particularly reflecting continuing discoveries and political events in the Americas.